If there's any doubt that solar power is the future, then the photo below should put an end to that! Here's a solar sail that may one day power space vehicles! Making the stuff of science fiction into reality, NASA engineers are testing solar sails--a unique propulsion technology that one day could enable deep space missions. Much like the wind pushing a sailboat through water, solar sails rely on sunlight to propel vehicles through space. The sail captures constantly streaming solar particles, called photons, with giant sails built from a lightweight material. 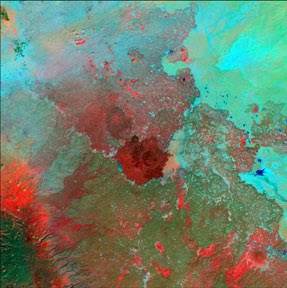 Over time, the buildup of these particles provides enough thrust for a small spacecraft to travel in space. 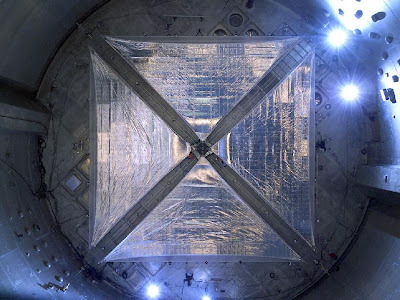 This image is of a four-quadrant solar sail system, measuring 66 feet on each side that is being tested in the world's largest vacuum chamber at NASA's Glenn Research Center at Plum Brook Station in Sandusky, Ohio. If they can figure out how to power multi-ton space vehicles, then surely, tiny Earth cars can be done, too! For more about the future of solar power here on Earth, check out Solar Revolution: The Economic Transformation of the Global Energy Industry by Travis Bradford [333.7923 BRA]. 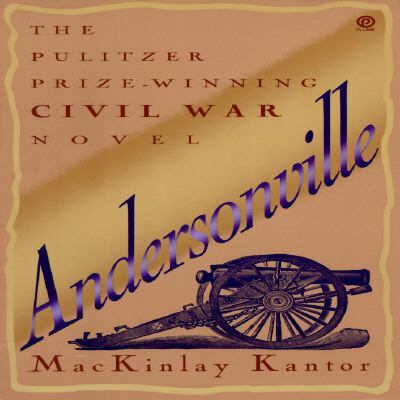 The American Civil War took place 150 years ago. In that time we had already developed the art of photography and a good portion of the war was documented by photographers. Still, new information continues to be found through the work of archeologists. Some of this work unearthed artifacts from a Confederate prison camp. Camp Lawton, was located in Georgia and has been relatively undisturbed since the war ended. Lawton was opened to handle the overflow of prisoners from the most notorious of prison camps, Andersonville. Although it existed for a very brief time, Camp Lawton is proving to be treasure trove for historians. To learn more, click here and here. 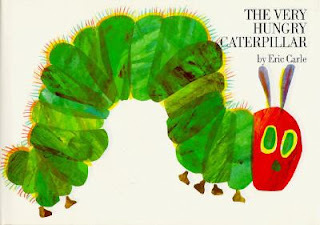 Poetry Friday--"Did You Ask Dulcet Rhymes From Me?" 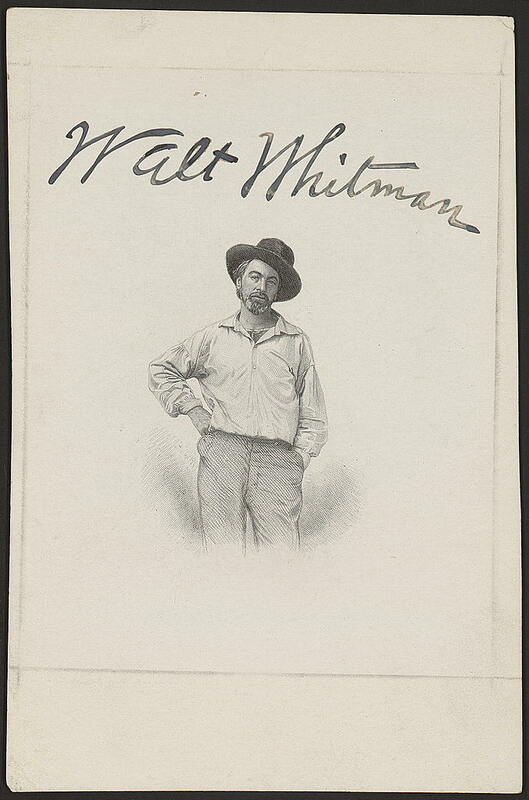 Walt Whitman was one of our most nonconventional 19th century American poets. In our collection we have a volume called The Poems of Walt Whitman (Leave of Grass) with Biographical Introduction by John Burroughs it was published in 1902 with this "Publishers' Note"
Various editions of Whitman's writing having created some confusion in readers' minds, we deem it advisable to state that the present volume contains the text of "Leaves of Grass," as published in 1860, together with "Drum Taps," of five years later. For I lull nobody—-and you will never understand me. According to an article on Whitman on the Poetry Foundation website, "he added, deleted, fused, separated, and rearranged poems as he produced six distinct editions of Leaves of Grass." Which version of "Did You Ask Dulcet Rhymes From Me?" do you prefer? My preference is for the first one. There's no making excuses with that one. Whitman is clear in what he means to say, "You don't understand me and I don't care." Visit Book Aunt where you'll find scads of interesting Poetry Friday postings to explore. Do You Know Who Knows? Those of us who are a little older, and hopefully, wiser, than our young folks, probably know that there are "privacy" settings that can, and should be used, for our Facebook accounts. In an article written by Jerome Taylor, "Google Chief: My Fears for Generation Facebook," we learn that privacy is not often guarded by the younger generation. The consequences could be detrimental to one's future prospects (education, jobs, etc.). Scary. But, perhaps, I gave adults too much credit--recently, over the border in Massachusetts, a school administrator, was forced to resign over comments that she posted on Facebook. This was an educated person! Educated, but perhaps lacking in common sense? Young or old, be wary. Social networking sites can turn out to be socially dangerous! 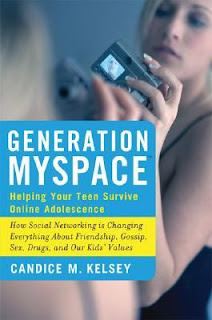 You may be able to help your kids by consulting Generation Myspace: Helping Your Teen Survive Online Adolescence by Candice M. Kelsey [305.235 KEL]--the key though, is getting them to listen. As for yourself, read the chapter in Facebook for Dummies by Carolyn Abram [004.69 ABR], "Privacy and Safety on Facebook," and follow the directions! Ten billion historical documents--that's a lot of things to stand watch over! Ten billion is the approximate number of records in the National Archives, and, according to a recent Los Angeles Times article, "Guardians of the Nation's Attic," "When Paul Brachfeld took over as inspector general of the National Archives, guardian of the country's most beloved treasures, he discovered the American people were being stolen blind." Holy cows! We are the American people! It's our historical stuff that has been purloined! 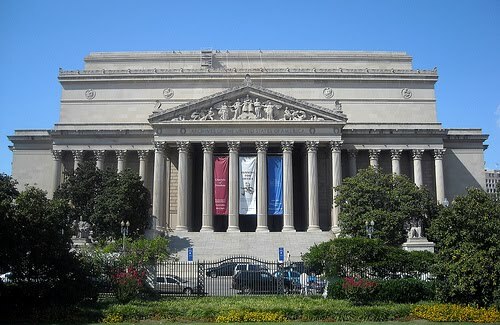 Art museums are generally targets for thieves, which is understandable, but archives? Think of this--if, on the auction circuit a letter signed by Lincoln goes for tens of thousands of dollars, then the idea of document theft suddenly makes more sense! Especially when a letter-sized document can so easily be hidden up a sleeve! Fortunately, WE have a team of crime-busters at work on our behalf under the supervision of Paul Brachfeld. Thanks guys! 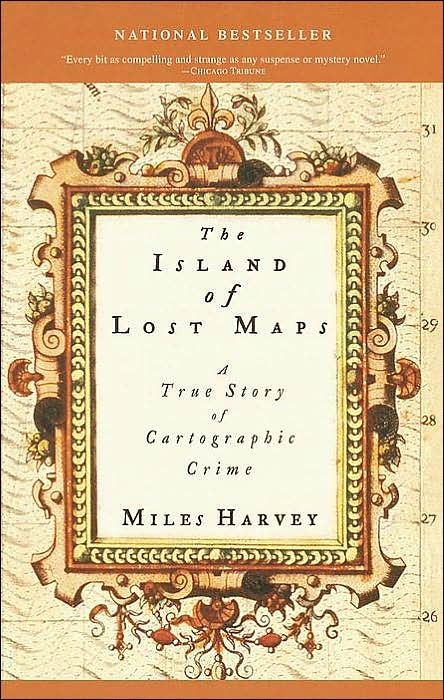 ...discovers the Island of Lost Maps. The deeper Miles Harvey investigates, the more we are drawn into this fascinating subculture of collectors, experts, and enthusiasts, all of them gripped by an obsession both surreal and sublime. Three years ago, Eat, Pray, Love: One Woman's Search for Everything Across Italy, India and Indonesia by Elizabeth Gilbert [B GIL, also in audio AB/CD B GIL] was on every women's book discussion group reading list. Now, the filmed version of the book starring Julia Roberts has opened at the theaters and should be available on our shelves as soon as it is released in DVD format. Courtesy Doug Savage (many thanks, Doug). Check out his website, Savage Chickens, and look for Savage Chickens: The Book, coming next March. Forty years ago, when tv programs like Bonanza were popular, if you mentioned "branding," everyone thought, "burning a symbol into the rump of a cow." Today, though, branding means something completely different. The Branding of America: From Levi Strauss to Chrysler, from Westinghouse to Gillette, the Forgotten Fathers of America's Best-Known Brand Names by Ronald Hambleton [338.02 HAM] is an historical look at some familiar brands. In the 1980s, when the book was written, there were brands included that no longer exist today. If a brand/product is not kept current, then it soon fades from the public consciousness. As seen in the book mentioned above, products were often named after their creator. 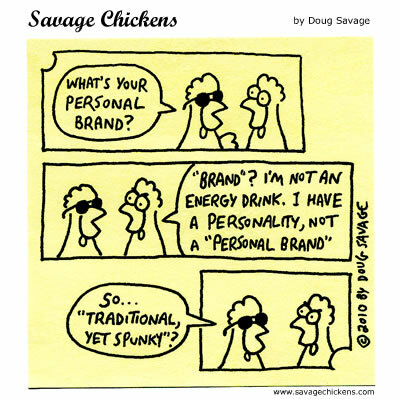 But, as seen in the Savage Chickens cartoon, branding is now being applied to individuals--they ARE the product. Tom Peters, author of the best-seller, A Passion for Excellence [658.4 PET], explored this idea in an 1997 article called "The Brand Called You," check it out here. A multi-talented lady (poet, novelist, essayist), May Sarton was born in Belgium, but moved to Massachusetts when she was three. She lived for a time in New Hampshire, as well as in Maine. I guess we could safely classify her as a New Englander! 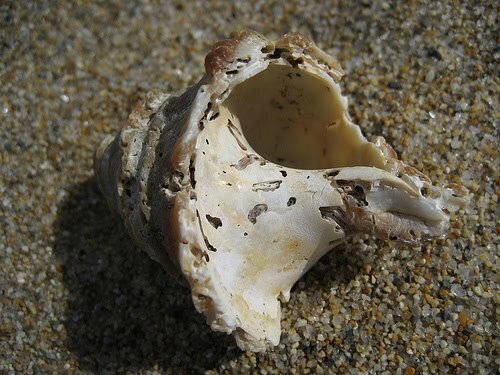 Today, I'd like to share "Shell" from a book published in 1984, Letters from Maine: New Poems [811.54 SAR]. And opened to the tide. That's a killer last line, don't you think? So unexpected! We have several of May Sarton's books including The House by the Sea: A Journal [B SAR], which tells of her move from New Hampshire to the coast of Maine. 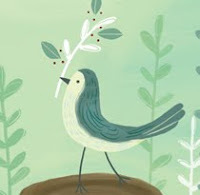 Laura at Teach Poetry K-12 is hosting Poetry Friday Round-Up this week. It's just two weeks before the kids go back to school. You've probably run out of daytrips to take, and ideas to entertain them, these last two weeks could very well turn into a trip through purgatory! Although you don't want to hear it, the time between the start of school and the holidays will pass by in a flash. So, in the next two weeks, involve your kids in making some unique holiday wrapping paper. It'll provide them with a creative activity, have a practical result, and, keep them out of trouble, . We recently added Print & Stamp Lab: 52 Ideas for Handmade, Upcycled Print Tools [761 BUN]. This book by Traci Bunkers explores a simple craft idea--making printing stamps--and has made it accessible and doable for the average person. Using materials found around a typical home such as erasers, pencil grips, bottle tops, buttons, rubber bands, etc., Bunkers has created some awesome printed papers. With your kids, keep it simple: salvage disposable materials like rubber bands and bottle tops; use rolls of plain white or brown paper; use red, green, and/or blue craft paint; consult Print & Stamp Lab for inspiration, and have fun! How many of you took music lessons in elementary/middle/high school and after graduating never picked up your trumpet/sax/flute/fill-in-the-blank ever again? That instrument is now gathering dust. Wouldn't you rather see it put to good use? Think about donating it to Lt. Colonel Cheryl McAuley who will see that the instrument is shipped to Iraq where it will be put to good use in Iraq's National Band or by music students. McAuley was interviewed on WBUR's Here and Now last month, you can listen to it here. Click here to learn more about the project, and what is still needed. We have a British film that clearly points out the power that music has to change lives. Look for Brassed Off! [DVD BRA], starring a very young Ewan McGregor, on your next visit. It's too bad that there are so many people who are allergic to cats--otherwise, the library would greatly benefit from the addition of a cat. (Not that Kurious Kitty is in any way biased!) Cats are quite literate, you know. 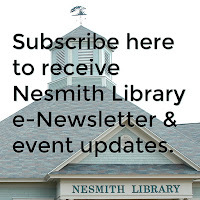 Although the Nesmith Library doesn't have one, there are plenty of library cats around the world, including several in New Hampshire! Literate cats also hang out in bookstores. The San Francisco Chronicle recently had an article about several bookstore cats in their area. And, of course, you know there would have to be a book about bookstore cats! It's in our children's room easy reader section: Bookstore Cat by Cindy Wheeler [E WHE]. The question of "what is art?" 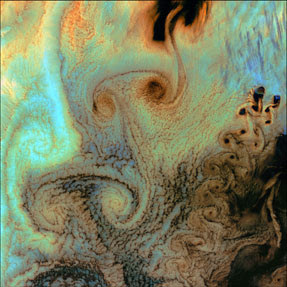 was raised when I found the NASA site, Earth As Art. Take a look at these earth photos--are they art? One of the books in our art collection is Looking at Pictures by Susan Woodford [750 WOO]. Of course, by pictures, Woodford is referring to deliberately created art. Still, it might be an educational exercise to read the book and decide whether or not the earth pictures fall into Woodford's concept of art. Edward Hirsch's latest book is The Living Fire: New and Selected Poems [811.54 HIR]. Hirsch is obviously a lover of public libraries (see "Branch Library" below), and that fact alone is enough to make me want to celebrate this poet! But, I'm also attracted to his writing, which I've found to be down-to-earth and poignant, without being cliched or sappy. I suggest that you make sure to read "Two Suitcases of Children's Drawings from Terezin, 1942-1944," it will grab your heart and wring it out, but you'll be honored to have stood "under the waterfall." I'm happy to recommend The Living Fire to all! You can listen to an interview with Hirsch (or read the transcript) here. One of the poems that Hirsch reads during the segment is "Branch Library." This week's Poetry Friday Round-Up can be found at The Stenhouse Blog. 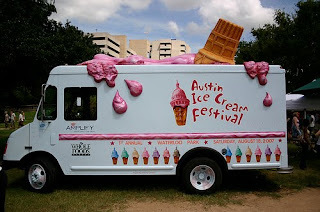 Actually, every season of the year is ice cream season, but, during this extra-hot summer, ice cream is especially welcomed as a cool treat. You know, you can make your own ice cream. There are recipes galore in The Ultimate Ice Cream Book: Over 500 Ice Creams, Sorbets, Granitas, Drinks, and More by Bruce Weinstein [641.862 WEI]. Fair season is almost upon us! One of the highlights of my yearly trip to the Big E is the huge butter sculpture that is constructed while we watch. The man who does the sculpture is Jim Victor, and, he is the official "butter artist in-residence." Jim Victor is also butter artist, cheese artist, and chocolate artist at other fairs and events around the country. You'll be amazed to see the extent of work done by this food artist when you check out his website. Who knew? Food art runs in the family, Jim Victor's wife is the artist, Marie Pelton. Pelton makes sculptures with elaborate arrangements of fruits and vegetables. You can see some of her work, too, on Victor's site. A less ambitious display of food art can be found in Good Things for Easy Entertaining from Martha Stewart [642.4 GOO]. The editors at Martha Stewart Living [MAG MAR] can show you how to make centerpieces from pumpkins and flowers, napkin rings from homemade pretzels, and more. It ain't a 500-lb. butter cow, but, it's still impressive! The day after school ended in June, Windham's Helping Hands set up their "little red schoolhouse" board. The board is covered with paper apples, each containing the back-to-school needs of a child in need. This is the last week to pick up an apple, purchase the required item/s, and return the item/s, unwrapped, to the Library. As you can see from the photo above, there are still a number of apples left. Don't let a child start school without adequate clothing or supplies--help Windham's Helping Hands! If you can't purchase an item, you can help out by making a donation here, or dropping off a check at the library. Many thanks! To learn more about Windham's Helping Hands, check out their website or Facebook page. After moving, eight-year-old Mallory struggles with being new at school, especially because her mother is now the music teacher and director of the third grade play. Describes what the first day of school might be like for a child in Kenya, Kazakhstan, Canada, Australia, Japan, China, Peru, Germany, India, Russia, and the United States. After Rory the raccoon conquers his fear of spending an entire night away from home, he is prepared to tackle the challenge of starting school just one week later, whether his parents are ready or not. First-grader Haley wishes she were back having fun in kindergarten with her old teacher, until she finds out that first-grade is special, too. The new school year gets off to a not-so-good start when Robert gets a bad haircut, but things improve when his father helps him plan a party for Halloween. Okay, here's an interesting new phenomenon--dream discussion groups. The New York Times had an article about it not long ago, and made the comparison to the proliferation of book discussion groups. Here's one more variation--how about having a book discussion about a dream interpretation book? Browse through our collection in the 135.3 and 154.6 sections and you'll find dream interpretation works by Zolar, Carl Jung and others. The work of the most famous dream interpreter, Sigmund Freud, is found in 150.19. I would recommend looking at Know Your Dreams, Know Yourself by Judith L. Scharff [154.63 SCH]. 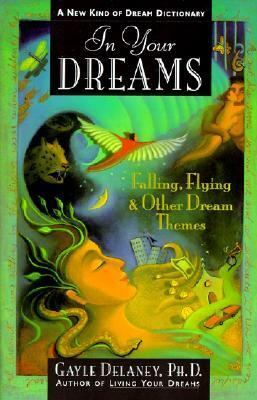 Judith Scharff came to the library several years ago to do a program on dreams. It was quite enlightening, and what she had to say made a lot of sense. To look at the work of Freud and Jung, you must realize that the people who were their subjects were those who were considered to have some mental instability. Scharff based her work on students at UNH, where she taught for a number of years. Students may have responsibility issues, but in most cases, they're stable mentally! The Best of It: New and Selected Poems [811.54 RYA], is the latest collection from Kay Ryan. Ryan recently ended her two year term as U.S. Poet Laureate (replaced by W.S. Merwin). 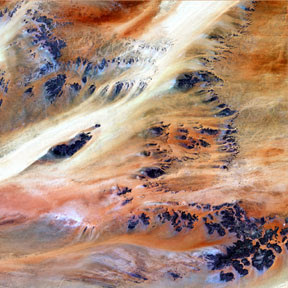 There are 24 new poems, and the "selected" poems come from her previous books, Flamingo Watching (1994), Elephant Rocks (1996), Say Uncle (2000), and The Niagara River (2005). If that doesn't get you to see trees and sky in a whole new way, than nothing will! Head over to Author Amok for this week's Poetry Friday Round-Up. If you're looking for a recommendation of a book to read this summer, Stephen King has 8 titles for you to explore. He recently listed them in an article for Entertainment Weekly, "6 Must-Reads for Summer." The six are really eight titles because King counts the three books in the "Millennium trilogy" as one. We currently own all of them except for the last one, Ordinary Thunderstorms, which is on order and should arrive soon. 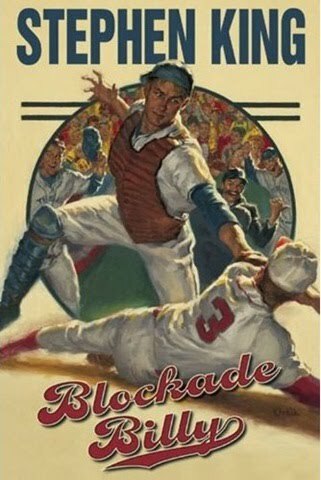 Stephen King's latest is Blockade Billy [F KIN], which was released in May. You would think that there'd be few aviation records left to break--we've come so far since the day the Wright Brothers took a 12-second flight on December 17, 1903. Not so. Recently, an unmanned craft flew for 336 hours (14 days) without stopping, powered only by the sun! There's a report here. And here's the truly amazing part--zero emissions! I'm glad to see solar-powered vehicles are possible, and I hope it won't be long before the technology can be used to ferry people around. For information on aviation history, check out our shelves in the 629.13 section. We also have an informative film, Magic of Flight, which although originally released back in 1996, still has some outstanding aerial shots. A few weeks back, the toy known as Etch A Sketch® celebrated its 50th birthday! I don't know about you, but I never had much luck creating even basic sketches. Some people, though, have been able to create what only can be described as masterpieces. 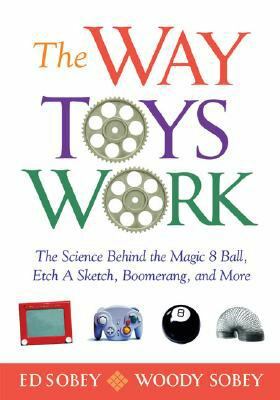 The Way Toys Work: The Science Behind the Magic 8 Ball, Etch a Sketch, Boomerang, and More by Edwin J. C. Sobey [688.728 SOB] opens the door to the secrets behind some classic toys. 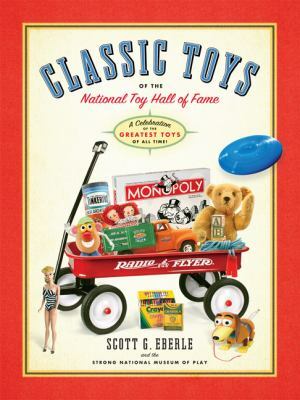 Tried and true toys are the subject of Classic Toys of the National Toy Hall of Fame: A Celebration of the Greatest Toys of All Time! by Scott G. Eberle [688.72 EBE]. Etch A Sketch is here as well as Monopoly, Tinkertoy, Slinky, and, "The Stick." The stick, a practical instrument, is itself a prototype toy. Easy to snap off a bush or a tree, a stick is always near at hand (or beak or muzzle): birds appear to play with sticks; otters, too; dogs famously fetch them in maybe the world's oldest interspecies game. Sticks have developed into the essential equipment in many sports. Not all that long ago, people made toys for their kids. If you'd like try your hand at making them, we can show you how. 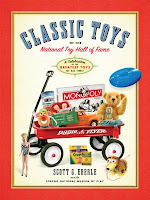 Well, not personally, but we do have this book by Pamela Peake: Making Your Own Toys [745.592 PEA]. Just about everyone's favorite caterpillar is The Very Hungry Caterpillar from the book by Eric Carle.